We try to focus on the positive here at 1 in Four. Although we touch on some very dark topics, because domestic violence is just that -- dark, we attempt to bring the light into them and talk about the hope and the survival after the fact. There will be days when you are fighting just to stay alive -- you have a looming court case facing you, whether it deals with charges against your ex partner, or a child custody hearing... you have to ask your friends, neighbours or even co-workers to fill out affidavits about incidents that they witnessed, or simply to provide a character reference... you swallow your pride and take that step forward in courage, hoping that things turn out for the best, all the while still providing for your children or taking care of yourself --- these, these will be good days, compared to the dark days. I cannot fully describe the dark days to you, because they will be different for every individual. For myself, much of them revolved around my daughter -- was I doing the best thing for her? How could I, this broken human being, possibly be the right one to raise her? I cried in the shower every day, and I slept for countless hours when she wasn't with me, drawing the blinds and shutting out the sun... I didn't eat well, I didn't drink enough water, I sank further into depression and I was uninterested in therapeutic medication... my dark days were lucky enough not to involve substance abuse -- but not everyone has the past that I have, to keep them from such outlets. The dark days will seem like they are going to swallow you alive from the inside out. I can't imagine how I would have gotten through if my daughter's needs didn't out-weigh my own selfish destruction. She had to be fed three times a day, and bathed, and sent to school on time and picked up .... and for a while I was simply going through the motions -- but she also had to be loved, and cherished, and enjoyed and cuddled and played with and nourished and read to and stimulated and taken to the park ... She was what pulled me from those depths. In the end, I had to WANT to be present to participate in the life around me. I had to WANT to be strong in the face of all that would pull me down. For our situation, it was routine that worked best. Having a set schedule of things that needed to be done and sticking to it. I filled my days, while she was at school, with groups and appointments -- things that would guarantee getting me out of the house, so that I couldn't lock myself away and sink back into depression. I got a library card! I attended group discussions, I went swimming at the YWCA, I joined an art group... I had a therapist, and a psychiatrist and a local counsellor -- so that I could see at least someone once a week to keep me in check. I built myself a support network and most importantly, I was HONEST with them... I told them how far I had sunk, I told them I was depressed... I let them know that I was still taking care of my little girl, that I was having more of a hard time taking care of myself -- I'd shower, and do the laundry, but making myself eat wasn't always easy.... I knew that I wasn't a threat to her, so I knew that I wasn't going to lose her... but I also knew that I couldn't get myself healthy if I wasn't willing to be honest about the help and support I needed. 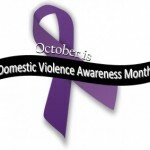 Domestic violence stole my courage and my self respect and my sense of decency in fellow human beings. I felt crushed and alone and dirty. I couldn't understand how anyone was ever going to love me again. With time, and healing, I learned that it was more important for me to love myself. I learned that I had a voice and if I used it, I could find my way back to courage. I learned self-reliance and self-esteem. I discovered friendships that were built on trust and mutual understanding. I guess, even though there will be those dark days, and even though I still have dark moments... the very truth of it is, with time, all these posts WILL be positive, because that is the life of a survivor -- you learn that you will not tolerate abuse in your life and you find the path that leads to a healthier lifestyle than maybe you ever thought possible. The dark days cannot steal your voice; use it, let yourself be heard. Ask for the help you need, the help you deserve. Thanks for your post. yes, dark days. For some of us, dark days, dark months, dark yrs… dark lifetime. It’s true that if you don’t want to move through things or make a change, then you likely won’t. Effort is required and that’s often the tricky part when, as you put it, the Dark Days, consume you and hold you back. unfortunately there’s not a switch we can flip or a magical eraser for life so it comes down to facing these things in an appropriate manner that works for YOU specifically. it’s not the be all, end all but I find having good support system is helpful. Maybe it’s one person, or ten or multiple organizations, or professionals etc. I have found that I can have a ‘Dark Day’, but still have some sunshine coming down on me. And there are days in life when the sun is shining nice and bright, but suddenly a dark cloud rolls in. Just one itty bitty cloud, that brings dullness and treacherous weather. You write so hnseotly about this. Thanks for sharing!